Here we go once again with another possible “major winter storm” in the southeast. I think is was a week or so ago that our friends to the south of us in Atlanta were crippled by less than three inches of the white stuff? Someone dropped the ball on that one or at least it seems that way. I changed directions this weekend because this winter weather moving into the southern states from this storm has the possibility of bringing much, much more snow with ice. This could be one of the worst storms to hit the southern region of the United States in a very long time. This is why it is important that people get ready by preparing now for possible power outages and other problems caused by this powerful storm. According to weather forecast at present, this might be a combo storm which actually could be two individual storms back to back. The first storm would sweep across the southern states dropping rain, freezing rain, sleet and snow depending on where the low tracks. After the storm exits, the possibility exists for another new low to form off the Carolina coast pulling back into the eastern southern states with even more winter weather on top of what falls from the first storm. We were watching the grounghogs forecast the weather predicitons for six more weeks of winter during the first part of February. Those furry friends have once again nailed the predictions they have a knack at predicting so well. Depending on how much and how quickly the temperatures drop will play an important role in this storm or storms that are predicted. On the serious side, the calm before those possible winter storms is right now before us. This is the time for everyone who might be in the storms path to prepare. 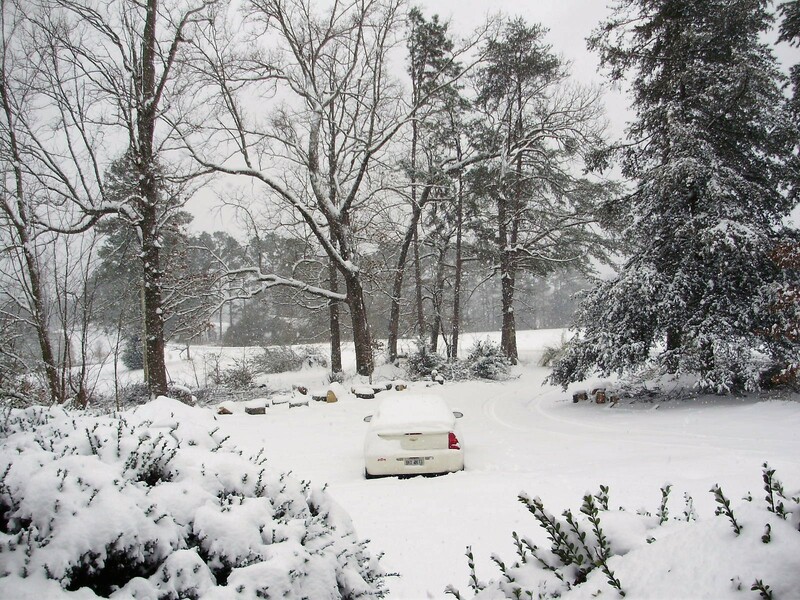 When winter storms hit the southeast, many of them don’t wreak havoc because either the cold air isn’t in place or the moisture content just hasn’t arrived when the cold is there. I’m takng this weeks winter storms potential seriously and getting ready for what could possibly be a record breaking event unfolding. We shall soon know how it all plays out but over the years, the southern states have been extremely blessed by winter storms not living up to their forecasts. It is one thing to have snow but to have possible icy conditions on top of it is extremely dangerous and these storms could have deadly impacts on many other people. The image above was from January 10, 2011. A beautiful wet snow fell during that day but the storm crippled the southeast yet again for days. The difference with that storm and the possible storms this week is the added mix of ice in the combination of freezing rain and sleet. Don’t take these storms as another cry wolf call this week everyone. This could be a weather related history making event for the southeast this week so get prepared now during the calm before the storm. It is always better to be ready than sorry later!